Soloist, chamber musician or improviser, he also plays and records solo, with tape or computer : in Europe, Northern América, Middle East and Asia. 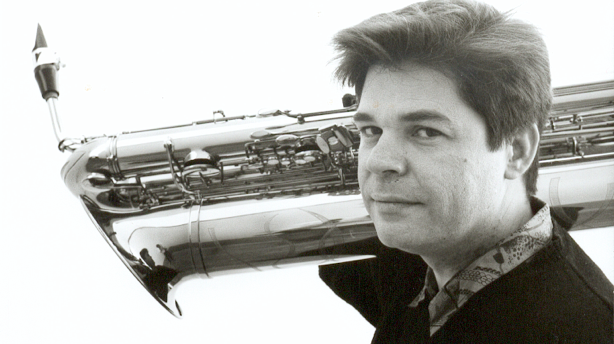 Serge Bertocchi is a laureate of the Paris Conservatory (1st prize with unanimity in saxophone and chamber music), along with 6 International competitions. He is recognised as a specialist of the baritone saxophone since the foundation of the Ars Gallica quartet in 1985, and of XASAX in 1991. More recently, he adopted (and plays regularly) extreme, rare or forgotten instruments of the saxophone familly : Tubax, soprillo, C-melody tenor, c-soprano and even the F Mezzo-soprano. He premiered around 200 new pieces by composers of all kinds, and recorded 38 CDs to this day. Click on images for more info. Premieres by John Oliver (Reims) Adi Snir, Julien Malaussena (Royaumont). XASAX ensemble was invited by the Festival de Royaumont 2012 for the composition session : premieres by Samantha Fernando (SATB), and Piaras Hoban with Makrokosmos. XASAX Tours in Switzerland and Austria. Concerts XASAX as soloists : Wal by Roland Moser with the orchestras of Bern and Basel. Project on Italian Musique with Mimmo Malandra : french premiere by Marco Betta. Concerts in the Auditorium Dutilleux, Amiens, and in the Teatro Fenaroli, Lanciano (Italy). Premiere of «Fifth hour at the dance party» by John Oliver for Tubax solo in Reims, Auditorium of the Conservatory. Solo concerts in Amiens, Luxembourg, Reims, Bâle. New solo pieces in the repertory : Stan by Christian Lauba (B), Décombres by Raphaël Cendo (Tbx/ordi), Ultimo a lato by Giorgio Netti (S) and many pieces by Tom Johnson (for MezzoSoprano, C-Melody, alto, baritone, tubax ... ). “Definitive” version of the Méthod of saxophone at editions International Music Diffusion. CD Project XASAX with Yochk'O Seffer : Coltrane, Seffer. Participation comme invité to «La Brocante Sonore» by Zic Zazou with F. Thuillier.